doing “macro” was a big deal with old film cameras. there were more than a few choices for getting really close to your subject. you could use (and can still use) specific lens made for macro. these can run the range of price from very cheap to very expensive. you could also close in on the cheap(er) using extension tubes. these turn an ordinary lens into one that gets closer. bellows allow getting even closer with more control. 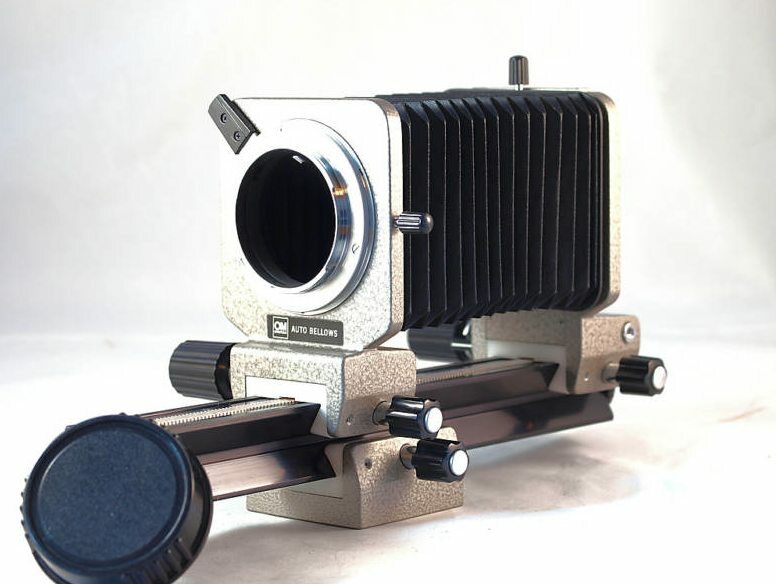 but bellows are hard to use because the exposure has to be calculated. using bellows also required a possibly complicated tripod/mount and extra lights. finally, if you wanted to be casual about getting up close you could use a “close up lens set” (aka diopters) which screw onto the front on any lens. diopters work with any camera no matter how cheap (or expensive). the problem with any of these is that 1) the require lots of light to work 2) they could introduce some kind of distortion (barrel, flare or plane) to the image 3) you didn’t know if you got the shot until the film came back. the good news is that practically every cheap camera has a macro mode. and while it is not perfect (we’ll talk about the why in a bit) it is a fun way to get really close to your subject. you won’t have to spend any extra to find out if you want to push into macro because you won’t need to have any specific gear or special lens for a DSLR camera. on most cameras the Macro mode can be entered in 2 clicks. on the Canon it’s the button on the left side of the circle. pressing it twice will put it in “flower mode”. on other cameras the word “macro” might be used instead of a universal icon. other cameras change settings with a dial on the top. if you aren’t sure how to enter “macro mode” check the manual or do a search. the settings for the camera are very important to have success for macro. you must turn the flash OFF. otherwise it will blow out the object. if you can use a fast shutter which will keep things from blurring if you hand holding your shot. and try to shoot with lots of light. which might require a light box, direct sunlight, defusers in front of shop lamps or a simple desk lamp. macro is not always easy and you will run into issues as you learn about it. first off the focus range is really narrow. 1/4″ too close (or too far) and it will not focus. this will require you to move the camera in and out from the subject to find the range. the narrow focus happens is because the lens aperture is wide open which causes the depth of field to decrease. in this example picture of dimes the middle dime is sharp while the top and bottom is not. if you forget to turn off your flash the first shot will remind you to turn it off. there are technique issues that go with macro. we already know that the biggest problem will be keeping your subject in focus. most of the time you won’t actually know if your image is sharp unless you look at it on your computer screen. the tiny screen on your camera won’t help you here. you’ll have to download your shots and look light can blow out edges easily because of the narrow focus range. hand held shots can be a problem because even the tiniest wiggle is like 100x amplified because of the closeness to the subject. rock steady is the only way you’ll get shots that look good. there are two additional things you can add to make taking macro photos more fun. make a copy stand so you can position your camera in the same place every time. adding adjustable lights will help keep your subject sharp and well lit. a light box is another tool that will help in getting consistent pictures of objects. you can buy light box for not much money or make a light box from things around you. we plan on talking about light boxes in length soon. shooting macro with a cheap shot is fun but it does have some downsides. the first is that it’s limited to how close you can get. there are sharpness issues because the lens is not made specifically for macro. this is just the beginning for macro. there are lot’s other ways to get close up shots using DSLR cameras, eye piece projection from a microscope, stack reversing a normal lens and using traditional macro gear with modern cameras. ARMY MEN ARE GOOD POSERS, SIR! send us your awesome macro shots and we’ll post them to the gallery.